You would think that a 60-lb. 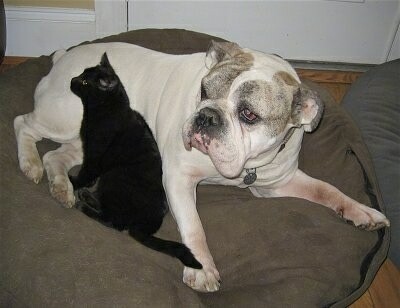 dog would be in charge of a cat, but the opposite is true. My cat Rusty took charge right from the get-go. The first time Spike saw Rusty, he chased her. Something must have happened that day that I did not notice because the next day Spike took two steps back when the cat passed. Ever since then Rusty never runs from him no matter how rambunctious he may be. She stands her ground and he backs up. They have become quite good friends. Rusty likes to lick inside of his ears and the top of his head. If he ever gets too excited while she is licking him, she just lifts up her paw and he flinches and calms down. It is a funny sight. It is as if she is his mother. Update 6/8/06 — Spike is now 9 years old and lives on a farm with about 20 cats, among other animals. All of the cats just love him. They rub up against his face. 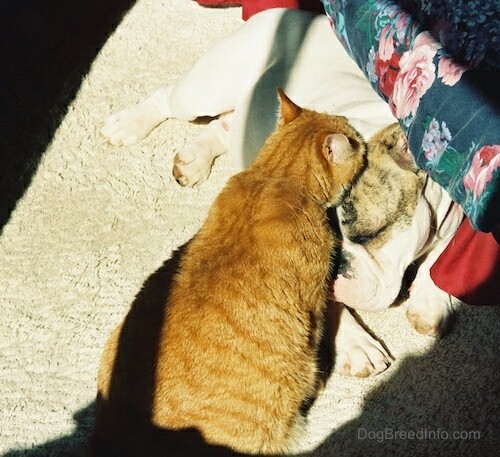 Spike can't go outside without a cat rubbing up against him. If the cats only knew how much drool they were getting on themselves! 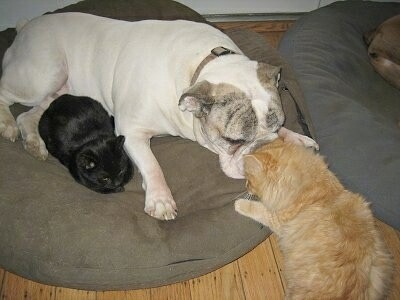 Spike with Coco and Sandy, his kitty friends. Spike with Coco; Coco just LOVES Spike.